Kotor tours are a hands down the most popular thing to do in Montenegro. Read on to find out whether a guided tour is for you and to see the best ones. Montenegro is full of interesting history. It's been the scene of many battles and then, just like today, it was also full of interesting personalities. 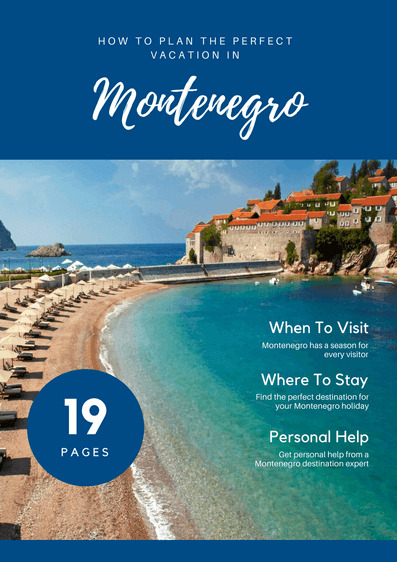 Unfortunately, it's hard to find out about Montenegro's local heroes and history unless you have a local guide with you! Like many other places here, when you visit Kotor, there aren't any signs or information placards telling you about the history or significance of a place. 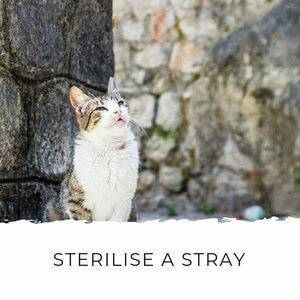 It's a common frustration of tourists here, and Kotor is no different. As you walk through the town you'll see signs of the names of buildings but no information about their history. Kotor is full of history and interesting stories, but you'll need a guided tour to discover it. If you're happy just exploring the town on your own, then you won't need any Kotor tours. You can read more about what to see and do in Kotor here. But if you want to see Kotor and learn about its history and important sights, I'd definitely recommend booking one of these Kotor tours. 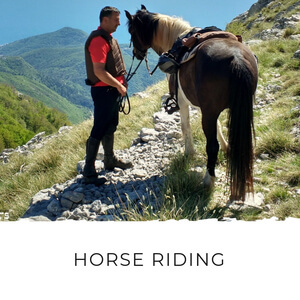 Whenever you book a tour in Montenegro it's important to make sure your guide is licensed. Only licensed guides are allowed to take tours and there are spot checks throughout the tourist season. What Kind of Kotor Tours Are there? Some tours shepherd you around Kotor in large groups where it's hard to hear the guide and impossible to ask questions. Because of the size of the groups, these Kotor tours can't stop at any of the sights in the narrow alleyways. Private and small group tours allow you to ask questions along the way. Private and small group tours take you into St Tryphon's Cathedral and the Maritime Museum (only the private tours include the museum). Private and small group tours can stop anywhere, meaning you can avoid the sun when it's heading towards 40 degrees (100 degrees Fahrenheit) in summer. Who can stand in the sun listening to their guide in that heat?! 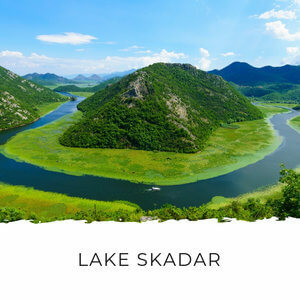 Find all tours and excursions you can do from Kotor. 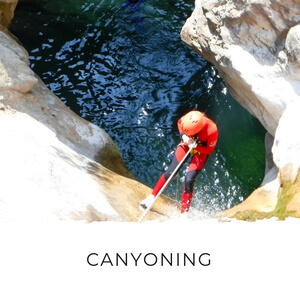 Why not try canyoning, rafting, biking, hiking or a boat tour? This is the best value walking tour in Kotor. It's ideal if you've only got a short time in Kotor and want to see the highlights. If you're visitin on a cuise ship, you might only have half a day to explore and this tour will help you get the most out of your time in port. 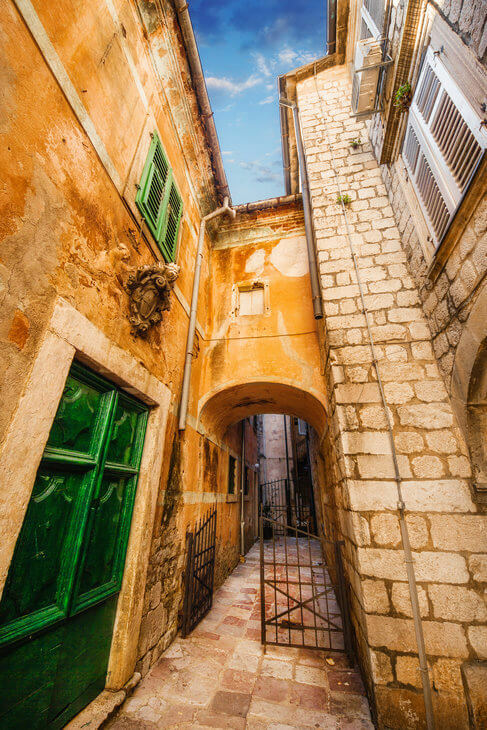 The tour will take you through Kotor's historic old town. Along the way the guide tells you about the history of Kotor and the churches and squares inside the walls. Once you've finished the tour you can go back and visit any attractions that interested you, like St Tryphon's Cathedral or the Maritime Museum. 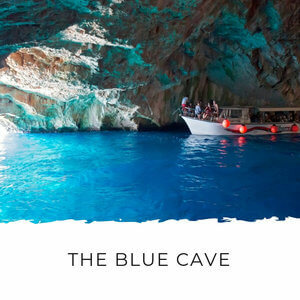 I recommend also doing a 2 hour boat tour to Our Lady of the Rocks and Perast or a 3 hour boat tour to Our Lady of the Rocks and the Blue Cave for the perfect day in Kotor. You can book private Kotor tours for yourself or a group. On these tours, the itinerary is tailored to your interests and you have a licenced guide who'll stay with your for the entire tour. 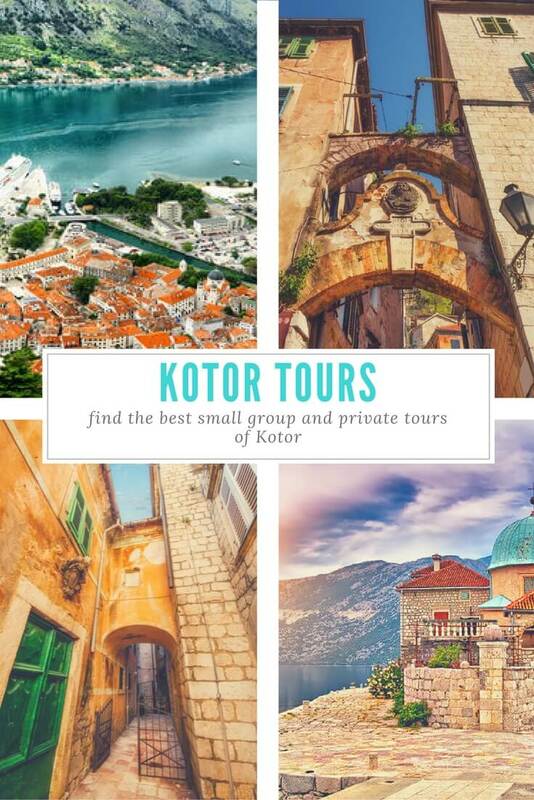 The private Kotor tours start from just €20 per person compared to €18 for a small group tour, so it can be worth paying a little bit more for more personalised service. I've listed tours that include Kotor and one that doesn't. They all start in Kotor. These private tours are booked with wonderful local guide Ana Badnjar. Ana has all five star reviews on Tripadvisor and will ensure you have an absolutely fabulous time. She knows Montenegro like the back of her hand and will be only too happy to tailor a tour for you. 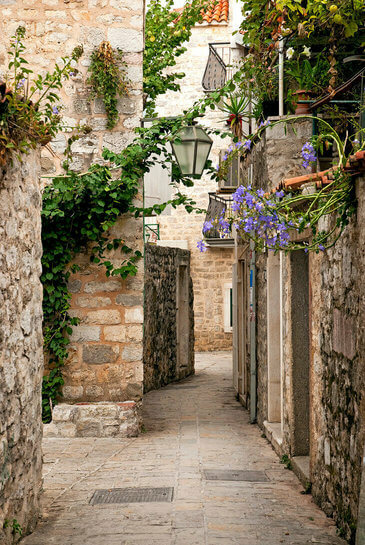 This private tour takes you on a journey through Kotor old town's most important sites. Your guide will also tell you about the history of Kotor and the entire region. Your guide meets you on the dock opposite the old town and personally walks you through the old town. St. Tryphon's Cathedral - 1166. The cathedral was built on the remains of a former temple from the 9th century. Inside, you'll see the remains of 14th Century frescoes and valuable artifacts made of gold from both local and Venetian artists dating from the 14th century. Kotor Maritime Museum which has a unique collection representing maritime history of the Bay of Kotor. The collection includes many historical artifacts, models and pictures of old ships and sailboats, plus ship parts and old instruments. 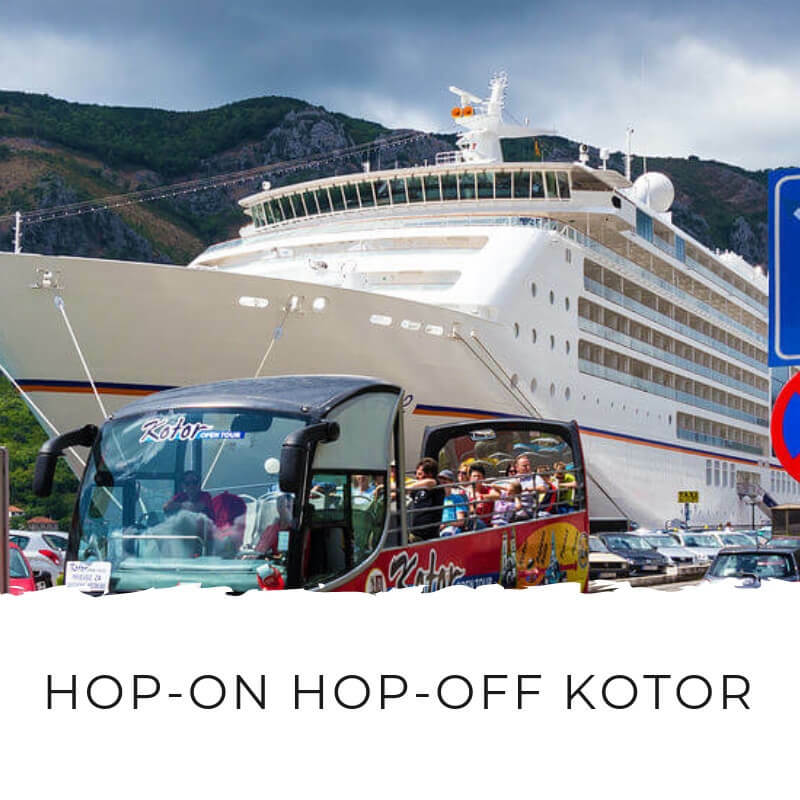 Difficulty: There is a moderate amount of walking on these Kotor tours. Folding wheelchairs are okay but some sites may be inaccessible. Please let Ana know in advance. 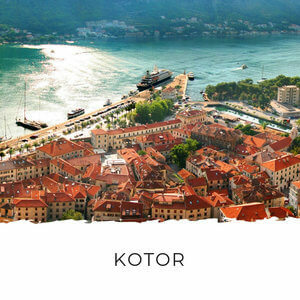 This tour takes you through Kotor as well as Montenegro's most famous resorts, Sveti Stefan and Budva. These are are both beautiful medieval villages on the sea. 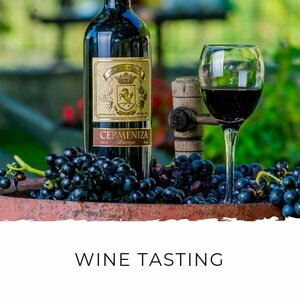 This is a great tour to get a flavor of old world Mediterranean Montenegro. 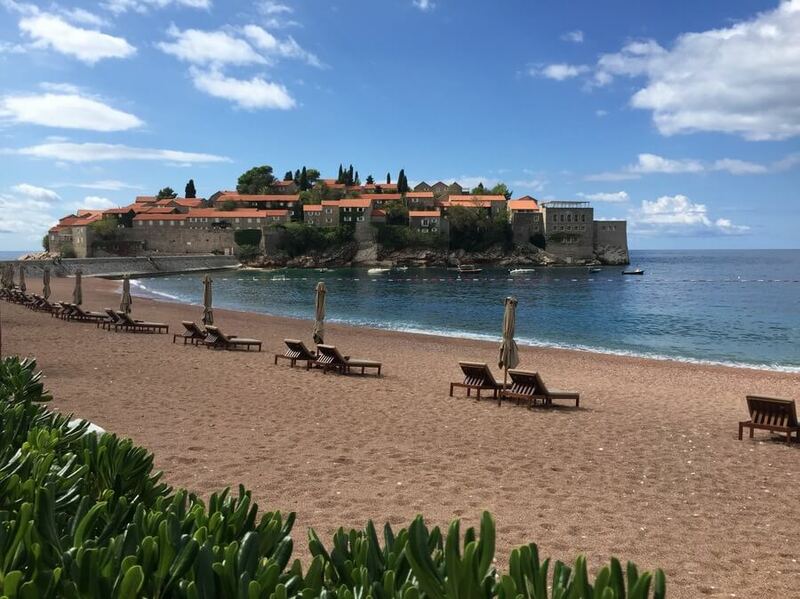 The tour starts with a scenic drive along the coast to Sveti Stefan. 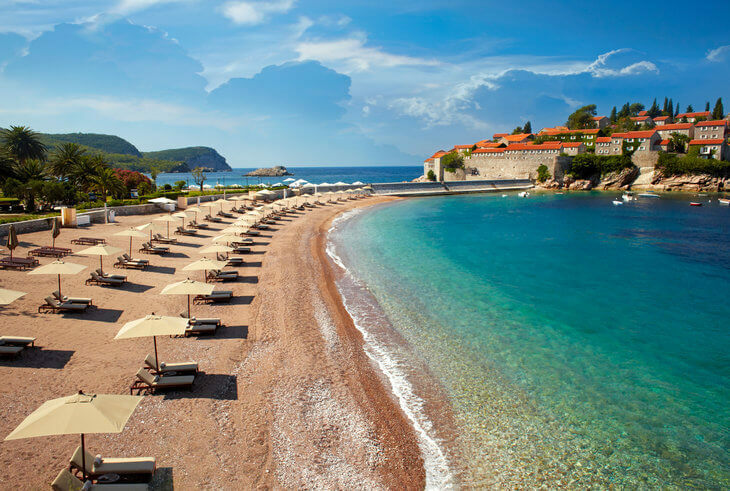 Sveti Stefan is a luxurious resort that once used to be a small fishing village, first mentioned in the 15th century. The island is now part of the Aman Resorts chain, so you can only explore the area and take pictures of it from the shore. Next you take a short drive to Budva. Budva is one of the oldest settlements on the Balkan Peninsula. It's surrounded by ramparts originating from the 15th Century and a medieval fortification system with city gates, defense walls and towers. Inside the walls, the town is a combination of narrow streets and little squares with valuable monuments of different Mediterranean cultures. After a walking tour in Budva you have free time for lunch and exploration before returning to Kotor. Back in Kotor, you have a walking tour through the maze of Kotor's medieval quarter, its bustling market and among the beautiful Renaissance buildings. Your guide will take you to visit to St. Tryphon's Cathedral, which houses 14th century frescoes and valuable gold works from both local and Venetian artists dating from the 14th century. Your tour also includes a visit to the Maritime Museum of Kotor, which has a great collection of artifacts from the bay's history. Private round trip transportation in a private vehicle: Mercedes E class, Viano or Vito. 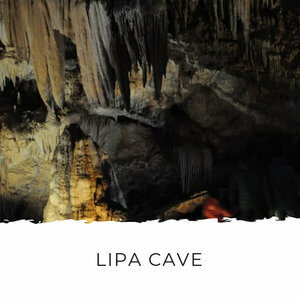 Difficulty: There is a moderate amount of walking on the Budva and Kotor tours tours. No wheelchairs. Tour Breakdown- All times are approximate based on traffic conditions and your personal interests. This tour includes a walking tour of Kotor and a boat ride to visit the small Baroque town of Perast and the island of Our Lady of the Rocks. 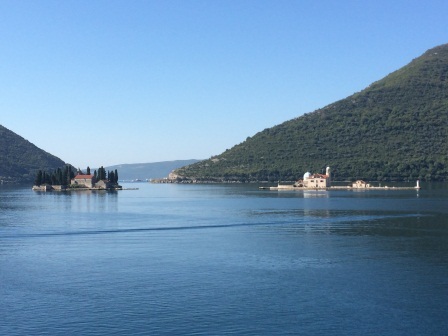 In my opinion, there's no better way to get from Kotor to Perast than by boat! After meeting your Kotor guide you'll enjoy a stunning scenic cruise along the Bay of Kotor to the island of Our Lady of the Rocks. You'll want your camera out for this trip! This man-made Island was built by scuttling old ships and depositing stones around a small crag. According to legend, the islet was made over five centuries by the seamen who kept an ancient oath. Upon returning from each successful voyage, they laid a rock in the bay. Over time, the islet gradually emerged from the sea. On the island you have a guided tour through the church and museum. After this, there's a short boat ride to the must-see UNESCO Heritage protected town of Perast, a beautiful example of baroque architecture. 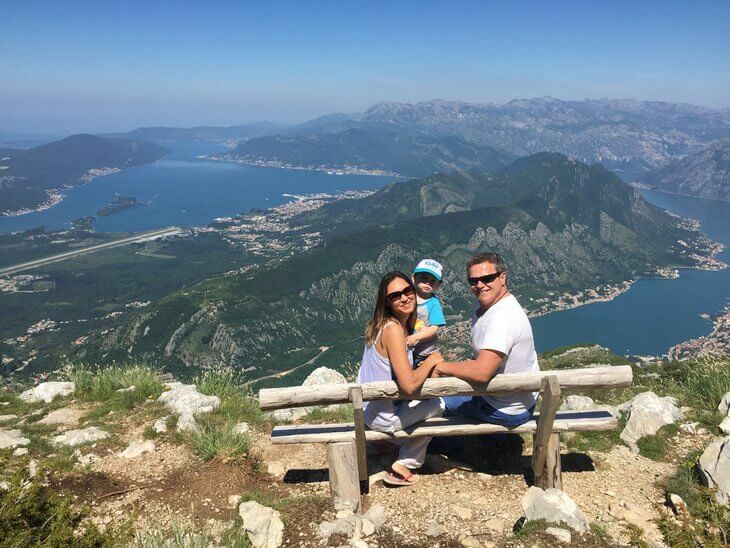 In Perast you have a short walk among buildings and villas which were built during the city's prosperous years of the 17th and 18th centuries and then you will have some leisure time to enjoy the breathtaking scenery. 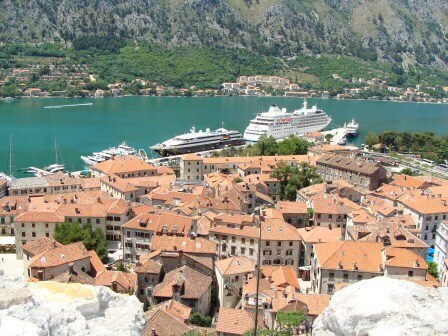 Next you cruise back to Kotor where you have a walking tour through the Kotor. The tour includes visits to St Tryphon's Cathedral and the Maritime Museum. 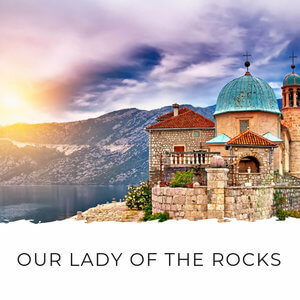 This tour includes a walking tour of Kotor and an excursion to visit the small Baroque town of Perast and the island of Our Lady of the Rocks. 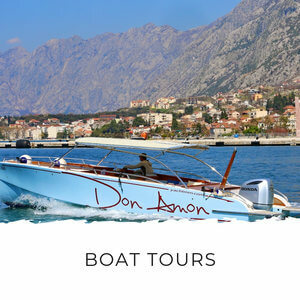 It's an excellent way to see the best of the Bay of Kotor. This tour starts with a 15 minute private transfer to Perast. From Perast you have a short boat trip to the island of Our Lady of the Rocks. On the island you have a guided tour through the church where you can see the celebrated artworks and learn about local customs of the area. After this, it's another short boat ride back to UNESCO Heritage protected Perast. 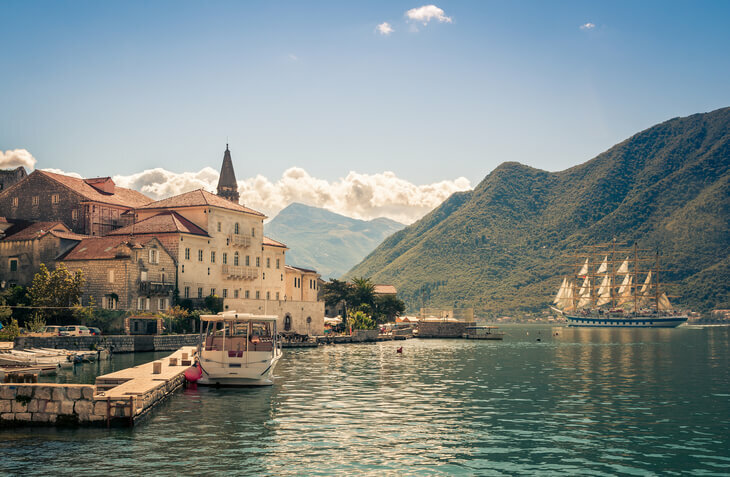 In Perast you have a short walk among buildings and villas which were built during the city's prosperous years of the 17th and 18th centuries and you'll have some leisure time to enjoy the breathtaking scenery. Then it's back to Kotor where you'll have a walking tour through the maze of Kotor's medieval quarter, its bustling market and among beautiful Renaissance buildings. The tour includes visits to Kotor's most interesting attractions: St Tryphon's Cathedral and the Maritime Museum. Both of these house collections of art, furniture and artifacts that are significant to the Bay of Kotor. 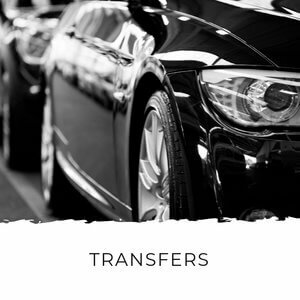 Transportation in private vehicle: Mercedes E class, Viano or Vito. Love food? Then this tour is for you! Skip the restaurants and get the real taste of Montenegro, that you'll only find in the homes of the locals. 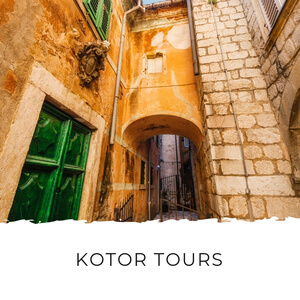 This tour starts with a walking tour through Kotor old town, through its medieval alleyways, markets and churches. After you've worked up an appetite you'll head to the home Mrs Mandic, where she'll prepare a feast of local specialities and flavours. The menu varies depending on the season and what's ripe in the local farmers market that day... just like in homes throughout Montenegro. 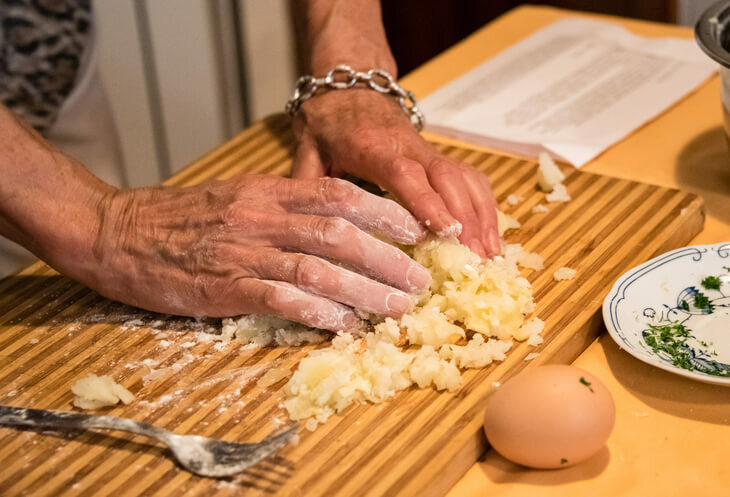 You might try gnocci made with potatoes from Grahovo village, sardines, mussels, proscuitto and finish with a traditional cream pie. Whatever's on the menu you're guaranteed it'll be fresh, local and delicious! 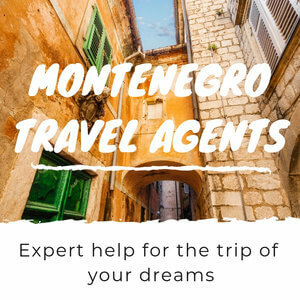 This full day tour visits the most popular sites in Montenegro including Kotor, Perast, Our Lady of the Rocks, Sveti Stefan and Budva. 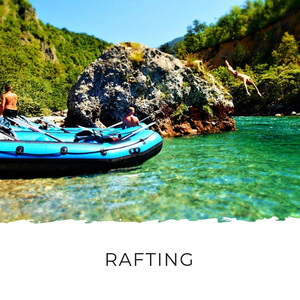 You explore the fjord by boat and then drive along the Mediterranean coast in a private transfer. 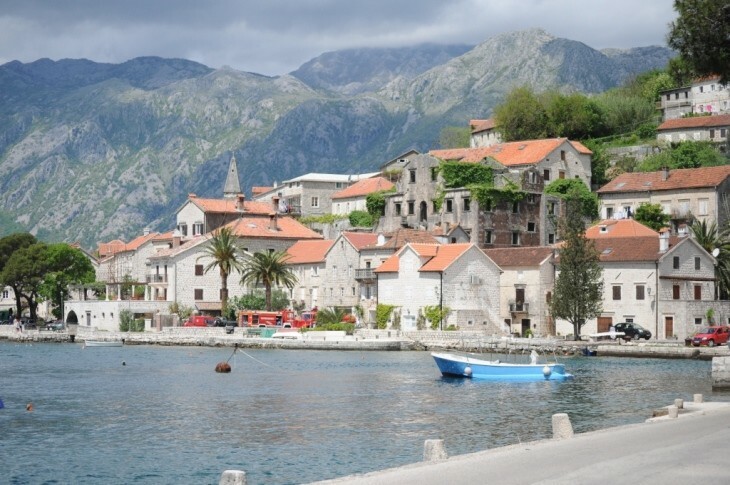 After meeting your guide, you'll drive along the coast to the village Perast. This small town is a beautiful example of baroque architecture. In Perast you have a short walk among buildings and villas which were built during the city's prosperous years of the 17th and 18th centuries. 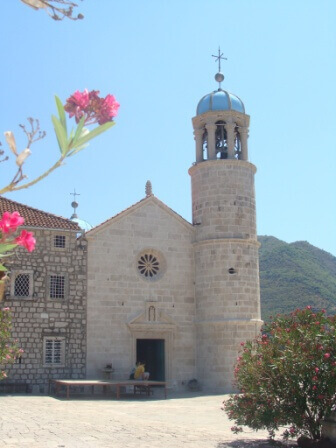 After your walk in Perast you take a short boat trip to the island of Our Lady of the Rocks. This man-made Island was built by scuttling old ships and depositing stones around a small crag. Upon returning from each successful voyage, sailors laid a rock in the bay. Over time, the islet gradually emerged from the sea. You'll have a guided tour of the church and adjoining museum which has a lot of artifacts from the area dating back to prehistoric times. Next you drive to Sveti Stefan, where you'll have a chance to take photos of one of Montenegro's top attractions. Then it's on to the ancient town of Budva which is the most famous resort in Montenegro. While you are in Budva you have free time for lunch (meal not included) before you go on a walking tour of the town. After the tour you drive back to Kotor where your guide will take you on a walking tour through Kotor. The tour includes a visit to St Tryphon's Cathedral and the Maritime Museum. Round trip transportation in private vehicle: Mercedes E class, Viano or Vito. 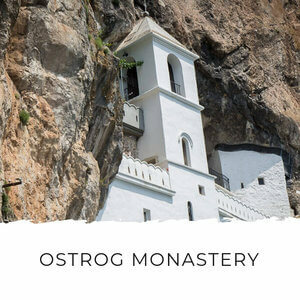 This tour visits two of Montenegro's cultural highlights, Cetinje Monastery and the Njegusi Mausoleum, which are located in the mountains above the Kotor Bay. This trip is worth it just for the views on the way up! On this tour you'll visit Njegusi and the birthplace of Petar Petrovic Njegos, whose mausoleum you'll visit later. While here, you'll be able to sample the local ham and cheese which the village is famous for. Locals stalls also sell local brandy and honey. 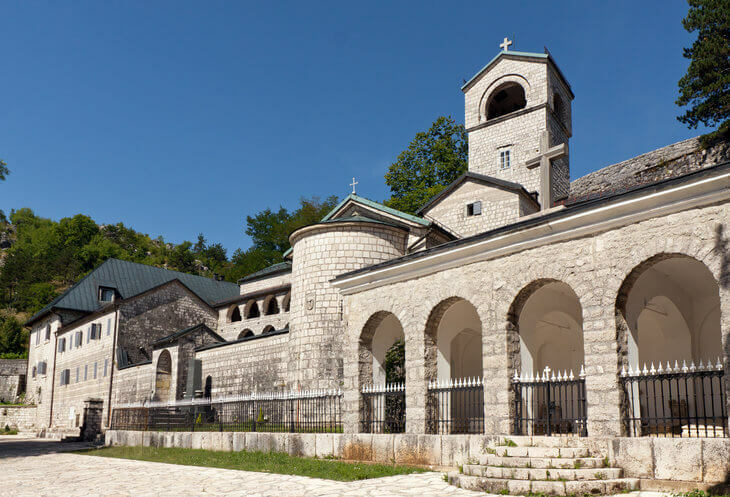 Next stop is Cetinje Monastery which dates back to 1701 and holds several important relics. The town of Cetinje was once the capital of Montenegro, known for both its religious and political powers. It's a cute little town and home to palaces, the national museum and the President's official residence. 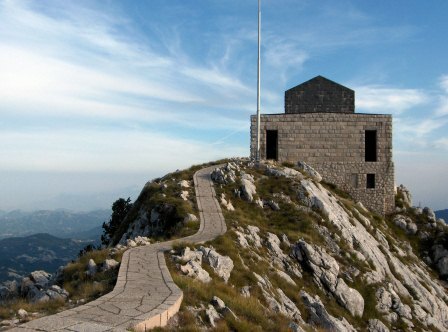 On the way back to Kotor, you'll stop at the mausoleum atop Mount Lovcen. You can book bespoke Kotor tours based on what you want to see and how much time you have to spend. 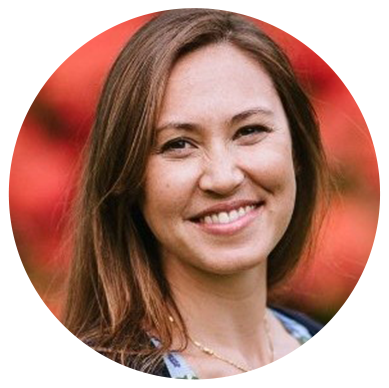 If you're not sure, you can just list your interests and Ana will design a tour just for you. The great thing about an experienced guide is they know exactly what will suit you. 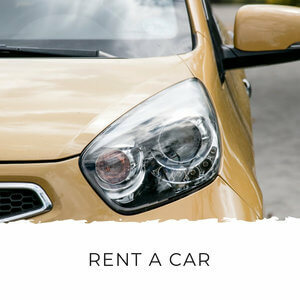 It saves you so much time and worry about find the right tour. You just leave it an expert's hands... couldn't be easier! 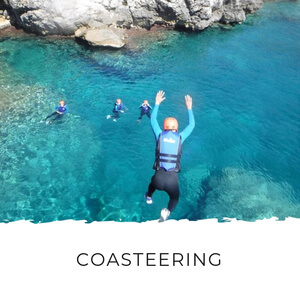 If you'd like to request a bespoke tour, just pop your details into the form below and a guide will get back to you with a suggested itinerary.